President Moon Jae-in expressed thanks to Indian Prime Minister Narendra Modi on Wednesday for sending him some "Modi jackets," a vest-like sleeveless jacket the Indian leader usually dons. Moon uploaded photos of him wearing the jackets in a Twitter posting, saying they "fit great." 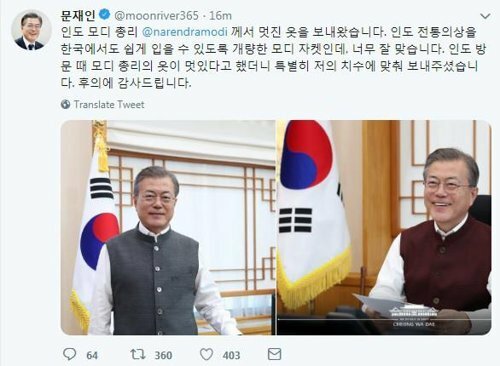 "This is a Modi jacket modified from a traditional Indian outfit so that it can be worn with ease in South Korea too," Moon said in the message. "During my visit to India, I told Prime Minister Modi that what he was wearing looked great, and he sent me some exactly my size. I thank him for his great kindness."